Published by almostaghost on March 10, 2013 in almostaghost and mixes. 0 Comments Tags: Brian Eno, Busta Rhymes, Dirty Three, Laura Marling, Life In Mixtape Form, Low, Method Man, NSNS, Sophie Zelmani, Stephen Malkmus, The Jicks. Life In Mixtape Form #88 from almostaghost on 8tracks Radio. A mix, a week, another one of those. Published by almostaghost on July 27, 2012 in almostaghost and mixes. 0 Comments Tags: Cee Lo Green, Eels, Jazze Pha, Jeff Buckley, Life In Mixtape Form, Menta Malone, My Morning Jacket, Pink Floyd, Sophie Zelmani, The Beatles, Weinland. Life In Mixtape Form #60 from almostaghost on 8tracks. In case you’re new or happened on here, I’ll explain. Every night, I pick a song of the day. I have a few methods for picking the song, but really it’s just something that in some way I feel like sharing, or represents the day somehow. Then, after 8 days, I can make a little mix on 8tracks.com. Then, PROFIT. The mixes are usually quick – I hope not too repetitive (though I definitely choose my favorite artists more often). Also, I don’t put as much work as I might on other mixes, so songs may not flow or be quite unbalanced or whatnot. They’re just little snapshot mixes. But I do stand by all the songs! 🙂 Thanks for listening. Published by almostaghost on April 29, 2012 in almostaghost and mixes. 0 Comments Tags: Beth Orton, Black Moth Super Rainbow, Captain Beefheart, Jim White, Life In Mixtape Form, Santigold, Sophie Zelmani, The Beatles, The Beta Band. Life In Mixtape Form #49 from almostaghost on 8tracks. Published by almostaghost on November 26, 2010 in almostaghost and review. 0 Comments Tags: 2010, 2010 countdown, Sophie Zelmani, Stockholm, Sweden. I’m The Rain continues Zelmani’s use of very elemental metaphors. I assume it is because she is Swedish, yet writing in English, but her songs tend to be about love, ships, rooms, weather, time—all the basics. She doesn’t get fancy. But again, this is not a criticism: the lyrics fit the light touch of the music very well, and are even more perfectly matched to her shy, whispered vocals. Less poetic, sure, but Zelmani’s lyrics come off as pure expressions. For instance, the opening lines of “If I Could” are: “if I could give anything, I would / if my thoughts could do you good / If I could help you with this part of life, you’d get a lift / You could load your weight on me.” Not the most beautiful lines ever written, but when you hear it, you know she feels it and is saying what she wants to say. What more could you want? I’m The Rain frequently borders on sad, but in the end is quite hopeful. She is always on that borderline. She uses piano riffs a bit more on this record to enhance the mood, and the acoustic-guitar beds on which she lays her voice can be surprisingly complicated (check that Spanish guitar on “You Can Always Long For May” below). 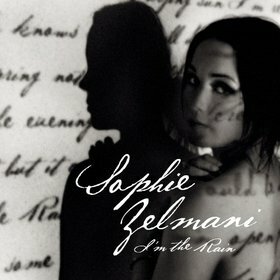 As Zelmani sings, “some prefer the sunlight and some like the rain,” and well, if she’s the rain, that’s what I prefer.